"Conflict is the beginning of consciousness"
My work, for the past 20 years, as a Mediator, Conflict Coach and Trainer in Conflict Management skills, has been to assist people in dispute. The observations, insights and Principles given on this website have been taught to me by the many brave, but determined people who wanted to create ways of resolving their conflicts effectively. "In my opinion there are few people in this country who are as skilled both as a practitioner and leading advocate of Conflict Management and Conflict Resolution as Alan Sharland. He has an excellent reputation in the field." - Marina Cantacuzino - Founder/Director of The Forgiveness Project. Are you involved in a destructive conflict? a tiff with your partner? a ruck with your boss? a sulk from your teenager? a riot in your meeting? gang warfare on your estate? some other kind of 'falling out' with someone? Has the problem become entrenched over a number of weeks, months or even years? Does it tire you out? Do you want some support? Do you repeatedly find yourself in the same kind of conflict situation with the same person or even with many different people? Do you work in one of the Helping Professions and wonder why you feel so overwhelmed by the demands of your clients? Or are you struggling with a destructive conflict situation at work and want to know how effective communication in the workplace can help? Do you want to find out how effective interpersonal communication can support conflict resolution in relationships? Do you want resources and approaches you can use to teach yourself and others how to resolve conflict effectively? Are you looking for conflict resolution exercises or training in effective interpersonal communication and conflict management skills that support conflict resolution? 9 Principles of Effective Interpersonal Communication which also support effective Conflict Resolution (you can even purchase a Guide that helps you to practice these). 6 Underlying Philosophies of Mediation - if you are a mediator or just interested in what mediation is 'about', these will explain the thinking behind my mediation practice. 3 different ways in which people tend to respond to conflict. Two of them never lead to a resolution of conflict. One of them helps us to resolve it and grow and learn from conflict. 3 Communication Skills that help us to be effective communicators, and help us to help others resolve their conflicts when requested. You can also buy an e-booklet that puts all the information about these skills together for easy reference. . Become more aware of your day to day use of language, such as labelling and 'I' statements, and how it affects your relationships with others. Develop skills that improve the effectiveness of your communication and your capacity to resolve conflict. Why 'Communication and Conflict'? further information on the thinking behind this site. Learn to approach relationships and interactions with others as a continuous opportunity for personal growth. Understand how many common stereotypes about non-verbal behaviour, often called 'interpreting body language' hinder effective communication. Lose your 'fear of conflict' through developing an understanding of the Principles of Effective Interpersonal Communication. Learn to empower yourself in any conflict situation through losing your dependence on others to 'change'. These are just some of the insights and challenges that you will find in the pages of this website. Are you a Conflict Resolution Practitioner looking for resources and further understanding of your field of work? What are the Underlying Philosophies of Mediation that underpin the insights and ideas discussed in this website? What is meant by a 'No-blame approach' or 'No-blame culture'? What is the Rescuer Syndrome and why is it a destructive response to conflict? Why is empowerment such an important aspect of effective conflict resolution? What is empowerment in this context? What are the effective communication skills used in supporting someone in the resolution of their destructive conflict? Would you like to Sit Back and Watch an Inspirational Video! The practices of effective interpersonal communication and effective conflict resolution are more about self-awareness than about techniques or 'strategies' for changing or 'dealing with' others. And that's great news. Because it's impossible to change others, but the possibilities for changing ourselves are infinite. And we each have the power to do so. Seeking to control or change others in a conflict is conflict suppression and conflict avoidance. It doesn't work. Seeking to control or change ourselves in a conflict situation leads to conflict resolution. It does work. Effective support for conflict resolution empowers people to find ways of controlling or changing themselves. 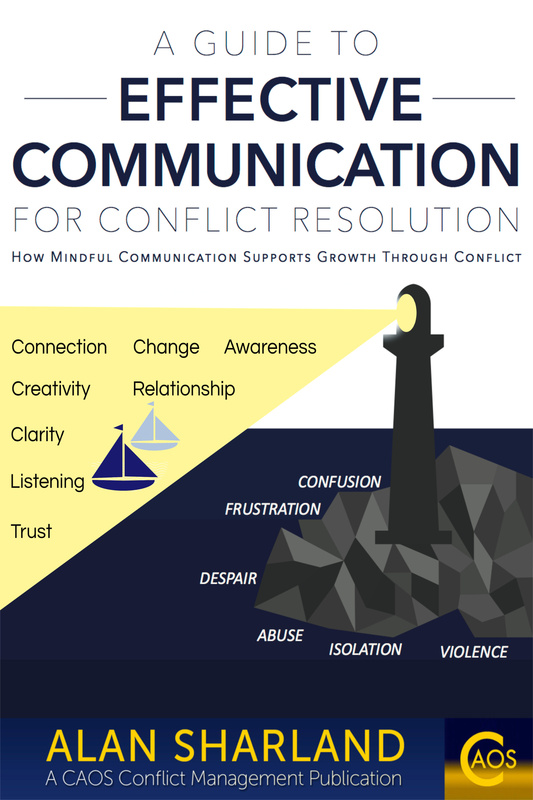 Click here to start your journey towards more Effective Communication and Conflict Resolution. I work at a homeless shelter/rehab and I teach a class on community living. This is a new field of employment for me. I can use this site for ideas for the class I teach. This is going to be very interesting and educational for myself as well as others. This site is a big help. Thank you! Working with 'Bullying'? - This may interest you…. You have put together an awesome web site with lots of fantastic materials. This article is the BEST article on questioning I have ever read and I'd like, with your permission, to pass it along to our mediators.Your examples of both genuinely open and 'not-so-open' with explanations are very insightful.